Shares of LGI Homes, Schlumberger, and A.O. Smith are at their lowest levels over the past year, but don't let their recent tumbles keep you away. Today, three that stick out as great companies to own for the long term but are trading at or near their 52-week lows are homebuilder LGI Homes (NASDAQ:LGIH), oil services provider and equipment manufacturer Schlumberger (NYSE:SLB), and water heater manufacturer A.O. Smith (NYSE:AOS). Here's a look at why their stocks are cheap and why you might want to consider buying them now. One of the most considerable constraints on the housing market today isn't a lack of buyers -- it's a lack of affordability. Just about any story these days about a slowing housing market involves the lack of affordable housing and rising interest rates taking prospective buyers out of the market. News like that should make a homebuilder investor nervous, but that may not necessarily be the case with LGI Homes. Instead of trying to build homes across the primary housing categories -- first-time buyers, move up, luxury, and active adult communities -- LGI focuses its efforts entirely on the first-time buyer market with both its approach to homebuilding and marketing. It focuses on developing land outside, but access to, major metro areas; it has fewer home designs in its portfolio and a more cookie-cutter approach to each home to cut down on construction costs; and it prices its houses in various markets such that mortgage payments are on par with rental rates, encouraging renters to build equity. At the end of the most recent quarter, the average selling price for LGI was in the $225,000 to $235,000 range. While that may not be an affordable price for everyone on the market, it is almost $100,000 less than the average selling price for most of its homebuilding peers and makes its home much more accessible than others. LGI Homes recently noted that home sales have slowed down a little faster than expected in the third quarter, but its focus on affordability should help to insulate the company from the downturn compared to some of its peers. 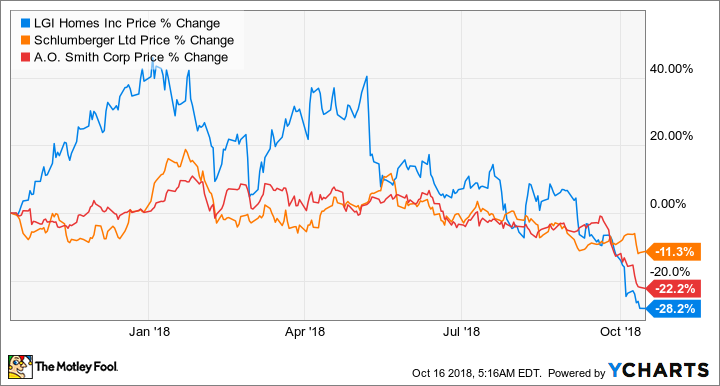 Despite this advantage, the market has been treating it like the rest of its homebuilding peers, and LGI Homes' stock currently trades at 6.6 times earnings. Even for a cyclical business like homebuilding, this looks like an incredibly cheap stock worth considering. For oil services giant Schlumberger, the decline in oil prices meant that its customers -- exploration and production companies -- were much more apprehensive to spend on new development projects. While we have seen activity in North America's shale patch recover as oil prices increased, the same can't be said for those outside North America. The bifurcation of the oil market matters immensely to Schlumberger because its business focuses on the international oil industry more than its largest competitor, Halliburton, which is much more tethered to North America. With the international prices for oil hovering around $80 a barrel and some short-term catalysts that could send it even higher, though, it's looking like the international oil and gas scene is about to take off again. For example, rig owner Transocean's marketing team anticipates that 57 new deepwater offshore projects will be sanctioned in the next 18 months. Offshore is a huge market for Schlumberger because of the services it provides as well as the large array of subsea equipment it manufactures. It's strange. Just before the oil market is about to take off again, shares of Schlumberger are trading near their 52-week lows and is actually below levels when oil hit its nadir of $30 a barrel in 2016. Sure, all of that new activity won't come overnight, but those looking to invest in the next surge in oil and gas activity should look at Schlumberger today. Water heater manufacturer A.O. Smith's business is facing a double whammy from tariffs and trade tensions with China. First, steel is a primary input for its manufacturing, and steel tariffs are drastically increasing costs. On top of rising input costs, A.O. Smith does a considerable amount of business in China -- about $1 billion in annual sales. Although management has not yet commented on what this most recent round of tariffs between the U.S. and China has done to affect its operations in China, we can assume that there will be some form of negative impact. All of this negativity has weighed heavily on the company's stock so far this year, as it is now off about 30% from its highs at the beginning of the year. All of this negativity didn't deter management from increasing its dividend for the second time this year, though. At the beginning of October, management said it was increasing its dividend by 22% as it anticipates long-term growth in sales, earnings, and cash flow. It would appear that that market is baking in a lot of pessimism about tariffs, but for long-term investors, it could present an opportunity. The company already has a reliable earnings engine in North America -- 85% of all water heater sales are replacements for existing homes -- and China isn't its only sizable growth lever to pull over the next several years. If tariffs end up being a short-term damper on how the market views, this stock could be a great window to build a position.